Popular Ford F-150 pickup truck spawns a pursuit variant. F-150 Police Responder bearing down on you. 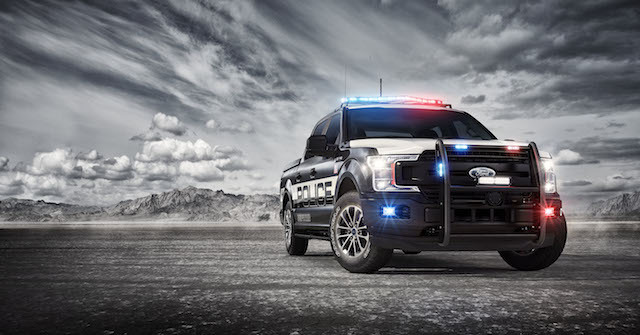 The Ford Motor Company has added yet another vehicle to its police pursuit vehicle arsenal. 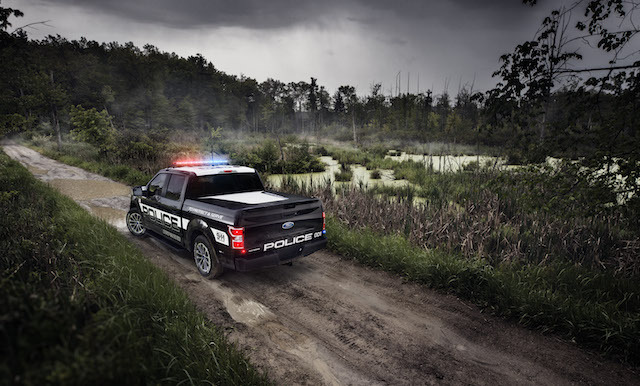 The 2018 Ford F-150 Police Responder joins existing sedan, hybrid sedan, and utility vehicle models to give law enforcement a new tool for their consideration. The latest model is capable of speeds of up to 100 mph. Moreover and importantly, it is also wholly suited for off road use, enabling personnel to conduct chases across the toughest terrain. Ford claims that its special F-150 is the first pursuit-rated pickup truck; this one derived from the F-150 FX4 off-road model. 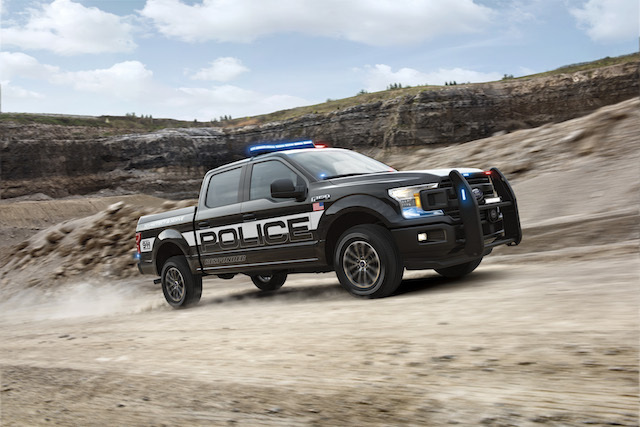 Powered by a 3.5-liter twin-turbo (EcoBoost) V6 engine making 375 horsepower and 470 pound-feet of torque, the police truck comes paired with a 10-speed automatic transmission. 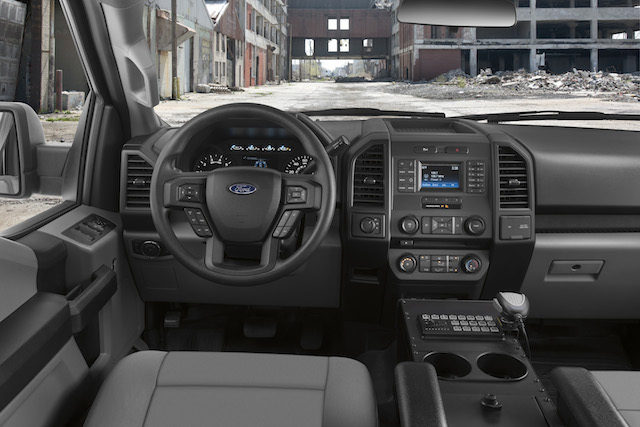 This SuperCrew (crew cab) truck sits on a 145-inch wheelbase based on a high-strength steel frame and features Ford’s high-strength, military-grade, aluminum-alloy body. 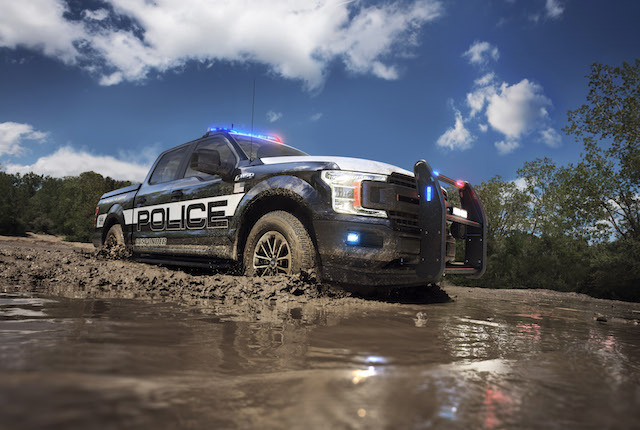 Besides being the most powerful pursuit vehicle available, the F-150 Police Responder also claims the largest passenger volume, payload and towing capacity of any pursuit-rated police vehicle. 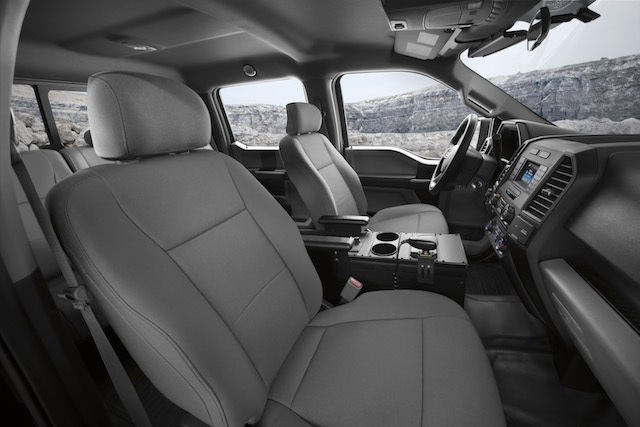 Further, the truck has best-in-class front and rear shoulder and hip room, as well as rear legroom. Pursuit vehicles are always equipped with law-enforcement-specific equipment and the F-150 Police Responder does not disappoint. For starters, a number of performance enhancements, such as a police-calibrated braking system with upgraded calipers and pad friction material, come standard. Also, each model has a modified front stabilizer bar for improved braking and handling, as well as 18-inch alloy wheels set within all-terrain tires. The interior is upfit-ready and comes with a column shifter with center-seat delete, heavy-duty cloth front seats (with light bolstering and anti-stab plates), vinyl rear seats, and heavy-duty vinyl flooring — the better for washing out perp vomit, mud, blood, excrement, and other bodily discharges. The truck comes equipped with a high-output 240-amp alternator for supporting on-board electrical devices, as well as a police-calibrated speedometer, and engine hour and engine idle hour meters. All models have underbody skid plates to protect the truck from curbs and rough terrain. 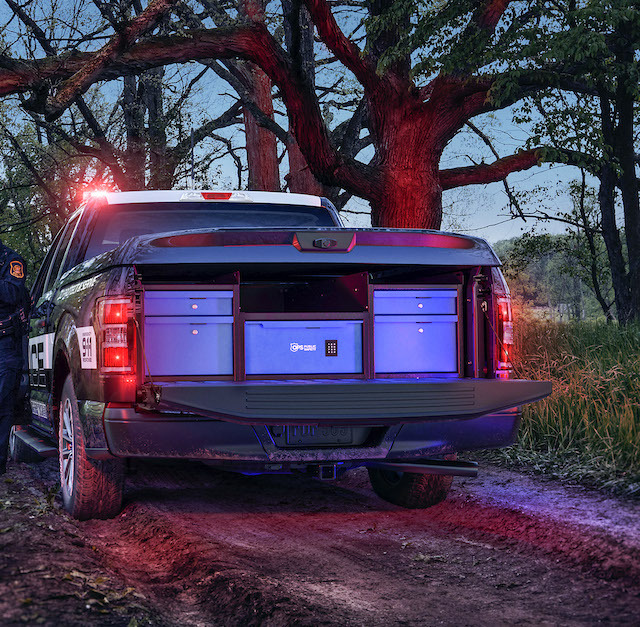 Each truck also has a standard class IV hitch, what supplies the F-150 Police Responder with a best-in-class towing capability of 7,000 pounds. 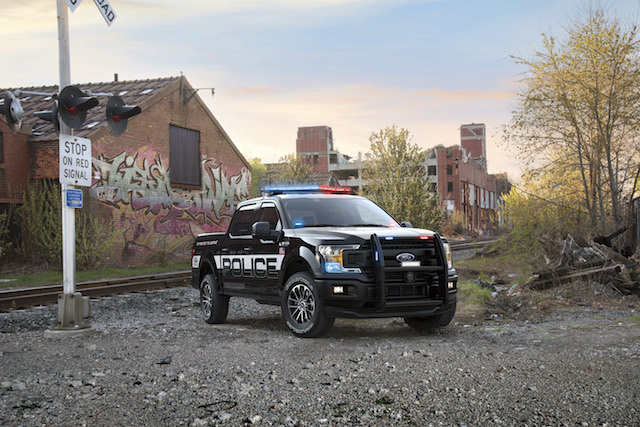 Besides the three other police responder models, Ford offers a Special Service F-150 and Expedition, a Special Service Police Sedan and even a Transit Prisoner Transport Vehicle. Ford’s pursuit vehicle fold now numbers four, but the status of its Taurus-based Police Interceptor Sedan is in question. Through August, Ford sold just 4,824 copies (down 12.8 percent) to 19,856 Explorer-based Police Interceptor Utility models (up 2.6 percent). Sales of the hybrid sedan have yet to start. With the P.I. Utility model possessing a 4-to-1 demand edge, production of the P.I. Sedan might cease. Further, the Taurus itself is now its ninth year with no plans announced for its replacement. An all-new model has arrived in China, but it isn’t likely here. Besides, that model shares its platform with the newly released Continental. Auto Trends expects the Taurus to have about one year of life left before it is finally canceled. That leaves three other Ford pursuit vehicle models for law enforcement come 2019. 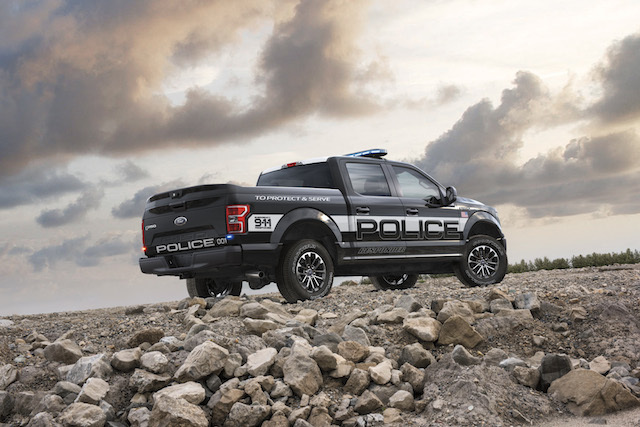 That said, if strong demand for the F-150 Police Responder follows, then additional models based on the upcoming Ranger (midsize pickup truck) and Bronco (SUV) might prove tenable for Ford. See Also — Are Cars Doomed? Not So Fast!